Did you ever say to yourself, “You’ve got to be young to do that,” and you might have been twenty-something looking at kids jumping on a trampoline? I’ve made up my mind, I’m not going to tell myself I’m too old for a new adventure. Research confirms that learning a mentally demanding skill will improve our thinking processes, especially if we move out of our comfort zone. A recent bicycle ride along Kelly Drive lingered in my memory as I thought back to that warm afternoon cycling along the river while watching the rowers slide along the water. So when I looked at the courses offered at Mt. 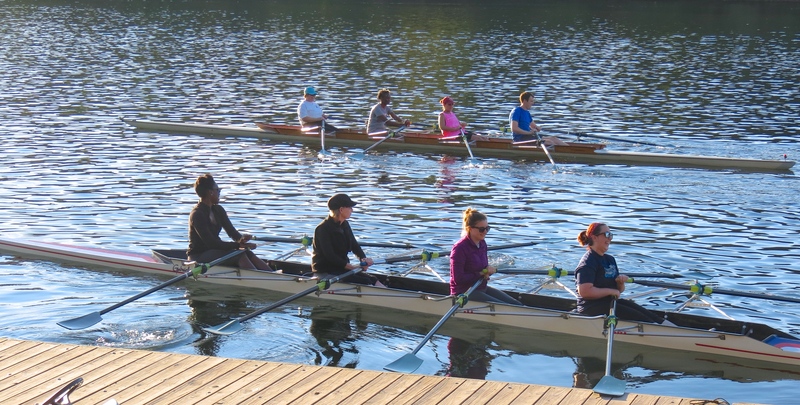 Airy Learning Tree, one of the classes, Row the Schuylkill, enticed me to sign up. 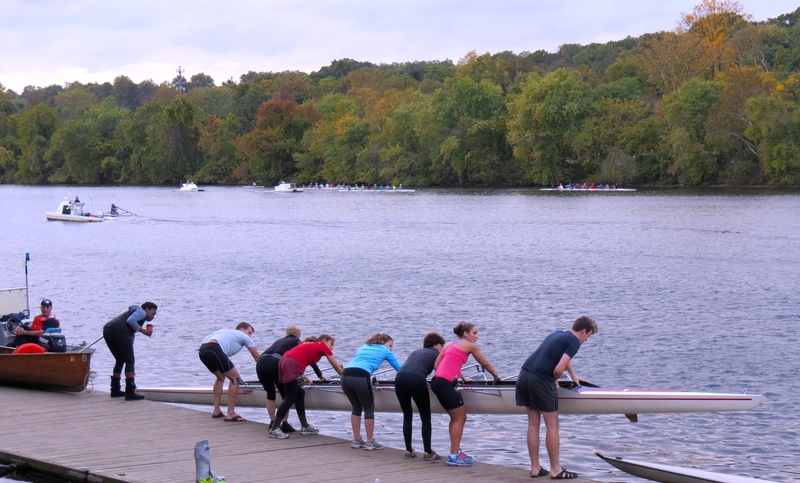 How many of us have wondered what it must be like to glide effortlessly along the Schuylkill River in a rowing shell? This course will provide one of the vest vantage point in the city to watch seasons change in Philadelphia. I tried to ignore my hesitation. I’ve had a hip replaced the other is, well, giving me some feedback now. Regardless, I signed up and returned to the gym for some exercise on the rowing machine. The Schuylkill River flows through Philadelphia’s Fairmount Park, one of the largest city parks in the country. The Philadelphia city scape sets a dramatic backdrop to the river with the Philadelphia Museum of Art, Waterworks buildings and the famous boat house row. Our launching dock is upriver from the architectural landmarks, and from that vantage, trees follow the river on both sides. Only the sound of traffic speeding along the Kelly Drive thoroughfare reminds me that we are in the city. The evening sun is setting and the water takes on the colors of the fading sky. In the distance, a brown stone bridge arches over the river. Arriving early for my first class, I pause at the edge of the river. What surprises me most is the number of boats on the water–it’s actually crowded with sculls, dragon boats and the small motored vessels transporting coaches next to their teams. Students load and unload along the docks, lifting their sculls over their heads as they return to shore. Examining the scull on the shoreline, I see an entirely different perspective than watching the boat in the river. 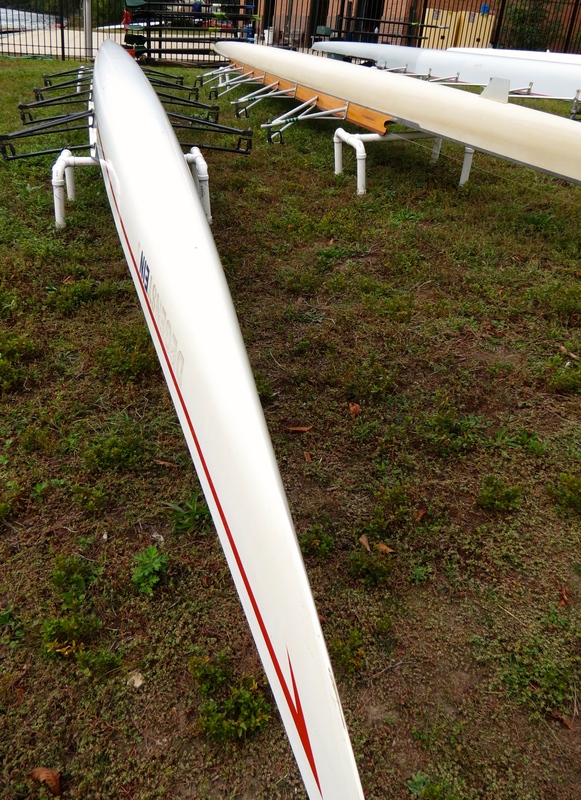 The sculls are surprisingly long for just four rowers, the quad size. I thought to myself, how do we ever maneuver such a long craft, let alone sit in that narrow well? Paddlers use two oars in a scull, one in each hand. I thought this is going to take some coördination. Whatever doubts I had about my first analysis, were soon dispelled by our instructor and coach, Brannon Johnson. With a decade of experience and as a four-year Division I collegiate athlete at the University of Texas, Brannon made beginners feel at ease with her lighthearted approach and detailed instructions. Although I have to say, I was very envious of the experienced group, who just got to hop into the scull and immediately paddle down river. Neubees had to learn a few skills and strategies first. The first challenge: getting into the boat without falling into the water. Brannon demonstrates how to step in the boat with one foot (an actual diagram of a foot is imprinted there, it’s that important to step correctly.) I envisioned myself stepping on the boat while one foot on the shore and doing a split. I moved my leg over quickly. 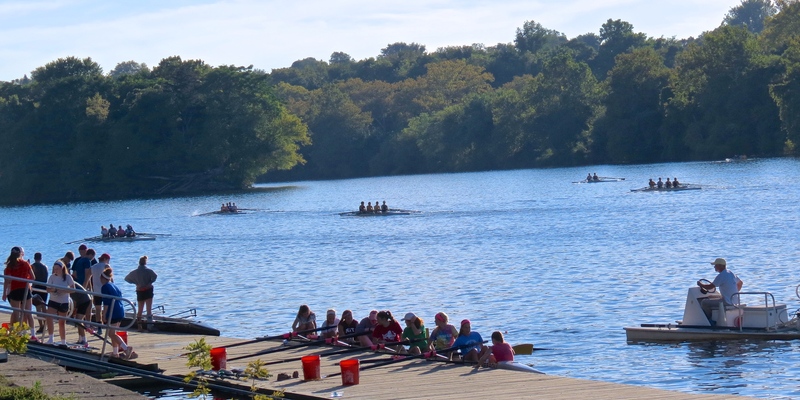 I noticed when the other rowers rocked the boat just a little, it seems that it could be easily tipped. Want to go fast like the other guys! Kado holds the tether so that prevents the novice from floating down steam out of control. On the second lesson, I had the first chance to row in the quad. After managing to get safely in the boat, Brannon patiently repeats the instructions: square and feather. You hold the oars squared when pulling in the water and feather (when face is flat) while returning the oar to the stroke position. What I had the most trouble with is not pressing down on the oars. Pressing down while stroking means the oar is not in the water but rather flying unhappily in the air. Even while feathering, the oar is supposed to stay close to the water. I have slight dyslexic tendencies, so the order of things can sometimes be difficult. I somehow confused the square with the feather and interchanged them from time to time. Yikes! 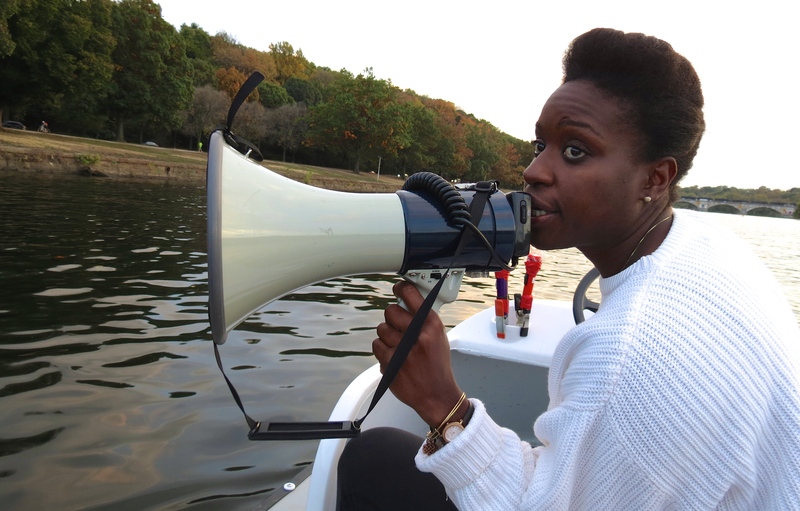 Kado, one of the assistants provides extra guidance on the single scull. Brannon reports that we all did very well as nobody landed in the water, which did happen during the one of the other classes. Does make a good photo opportunity, she noted. Lesson three is the most fun so far as we actually row down the river. Rowing demands concentration. I wanted to admire the scenery and gaze at the water; but when I tried that, I found that I became out of sync with my fellow rowers. Sculling demands a cadence, matching the movements of the others. While bending the knees, the seat rolls forward and then rolls back while pulling the oar through the water. I had to remember to place the left hand over right, and since left and right are interchangeable due to my dyslexia, I had to keep my brain focused on that position. Scullers face backwards; in the larger crafts coxswains monitor the direction. During class four, I return to the quad with two experienced rowers on board, making the skill more demanding as the cadence became faster and consistent. As in the last time, I focus all my concentration on the stroking, repeating to myself the steps as we glide up the river and under the bridge. Rosie, our coach, advises rowers on our techniques. 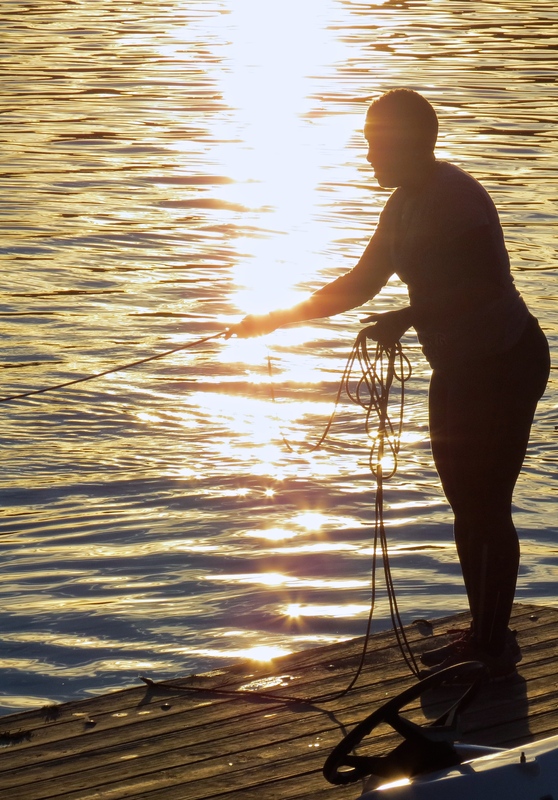 At one point, I “catch a crab,” which means that an oar gets caught awkwardly in the water. Rosie gets me back on track and into the cadence again. My muscles feel the effect of the exercise, but I have graduated to higher skill level! The evening weather continues warm and beautiful for lesson five. Children load off and on paddle boats lined up along the dock. Under the guidance of Brannon, I practice stroking in the single scull. During the last lesson, Brannon offers to take me out on the launch in the interest of promoting the sport on social media, since I mentioned that I was a blogger and would like to take video footage. Altogether we have two singles, one double and two quads out on the river, and we experience another beautiful evening on the water for our final session. Totally inspiring! I keep wanting to do this, but am too chicken. Thanks! Sculling is so much fun, and these folks from the Mt. Airy Learning Tree take students through the steps gradually, including being tethered to the dock until ready to go out. I remember Brannon saying that women don’t usually tip over. : ) You’d like it! Anyone who can guide a true beginner in her 50’s….please reply.